I started off making a meditation room in the loft of my home when I was 15. Up there I would sit in lotus and meditate.. and practice my kung fu. In those early youthful days how was I to know that this practice would fortify me, never desert me, save my life on several occasions and those of ones I love. So it really can and will make a remarkable difference for you and those around you. My practice continued and by the late 1990’s my school and learning/teaching practice in China, Thailand, UK and Perth Australia had become something popular and incredibly satisfying for all. It really is something very special this form of gentle meditative, non stress exercise… discovering at last your own chi or natural inner energy/power… an intimate connection to your self and your inner self. Why stress! ?… many people look at me and wonder why or how I stay so calm under pressure… this type of practice definately helps. My teaching of Chi Gung has always centred on breath control and visualisation along with perfecting the essential balance movements that we need in order to stay strong and healthy now and in the future. Often my lessons will be teaching how not to move: how to avoid incorrect body posture, shifting of weight and day to day healthy tips. How to step more securely, become more responsive and use double weight positions… sounds complex but is absolutely the most obvious simple thing when I show you! You will learn how to avoid injury and evade accidents. Not bad eh!! But how can we learn this and use it? … by gentle repetition which makes it natural or second nature. I made a move into the mountains and discovered the power of sharing purity, nature, love and friendships. I want to share with you the gifts that live inside your every breath, step and thought… you do realise you are incredible don’t you!? I realise you are… and that we can learn about our nature from nature and the mountains. I am starting my new relaxation classes called Chi Gung proActive meditation in Piacenza in March 2011. Why? Because it is a gift of life that I have practiced for a very long time and now must share again (since 2003 I have not taught this). This practice creates stability and power in the mind, body and spirit. This forms the first 3-6 months of initial practice. It is perfect for the modern people like us, living in a hectic world. Please email me for more information if you need and the first lesson will be 30 minutes free introduction – dates to be confirmed please invite friends and print post this poster in yr local school or suitable place etc etc. Dynamic qigong can be easily recognized as a series of carefully-choreographed movements or gestures that are designed to promote and manipulate the flow of qi within the practitioner’s body. Tai Chi Ch’uan, a Chinese soft martial art, is one well-known representation of dynamic qigong set to flowing movements. To an external observer, the series of movements are similar to gentle warm ups. To the qigong practitioner, the practice requires a unity of mind, body and spirit with the aim of promoting and controlling the flow of qi via breath and position. ProActive utilise this method in part or whole. Static qigong is performed by holding a certain posture, position or stance for a period of time. In some cases, static qigong bears some similarities to the practice of Yoga and its continuation in the Buddhist tradition. 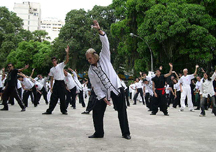 Yiquan, a Chinese martial art derived from xingyiquan, is a strong proponent of stance training. Eight pieces of brocade (Baduanjin qigong), a well known set of health exercises, is also based on a series of postures. To the external observer, the practitioner appears to be fixed in space. To the qigong practitioner, the physical and mental effort required to keep the posture results in the appropriate manipulation of qi and generation of internal health promoting power. 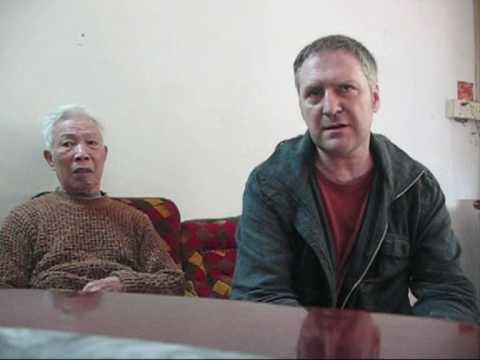 This entry was posted in chi, CHI Chi Gung chi gung qigon shan gung fu meditation clothing, De, chi gung, chi gung qigon shan gung fu meditation, tai chi piacenza, Uncategorized and tagged Acupuncture and Chinese Medicine, Alternative, Baduanjin qigong, Buddhism, Chinese martial arts, Health, Meditation, Qi, Qigong, Tai chi chuan. Bookmark the permalink.